Evening Primrose collects its name from the facts that its fine, sweet smelling yellow flowers open around six or seven in the evening. In Ancient Greece the roots of the Evening Primrose were eaten with wine (a little like olives are now) and it is said that it reduced the effects of the wine. Even now some cultures use the roots to garnish salads. It is said that Evening Primrose is the best preventative medicinal herb since the discovery of Vitamin C. The plants seeds contain the rare essential fatty acid called gamma-linolenic acid with the oil containing about 70% linoleic acid which is said to ease premenstrual pains. These essential fatty acids aid cell structure and greatly improve skin elasticity which explains why it is a commonly found ingredient in many beauty products including cleansers, eye creams, shampoos, body lotions, exfoliators and shaving oils. Early research is indicating that gamma-linolenic acid has promise in the treatment of breast cancer for it has a hormone balancing effect that helps to regulate healthy breast tissue. 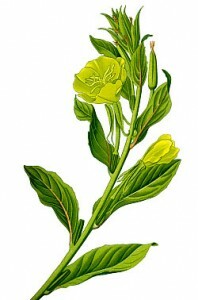 Evening Primrose also has sedative properties and has been used to successfully treat gastro-intestinal and irritable bowel issues, asthma and whooping cough. It is also used to treat a number of skin ailments including acne, allergies, dermatitis, eczema, sporiasis and rosacea.